Poachers are people who illegally kill animals for meat and other body parts. They have no permits, and they hide from the authorities. Poachers kill elephants because they can sell the ivory tusks. In Tanzania, they use automatic machine guns to slaughter entire herds, killing males, females and young animals. Safari hunters are not poachers. Safari hunters have permission from the Tanzanian government to hunt and from the United Nations (UN) to transport the tusks to their home countries. Safari hunters follow strict laws about shooting males, when and where they can hunt, how many animals they can shoot and how old the animals must be. In Tanzania, safari hunters usually kill 50 elephants per year while poachers have been killing about 7,500 per year. (“Press Environment;” Bandow and Wyatt). ​ As a result of the poaching crisis, the elephant population is dwindling, legal hunters have been losing their rights, and already poor African families are losing the income that the hunting industry used to bring them. One-third to one-half of the tusk is lodged in the skull. 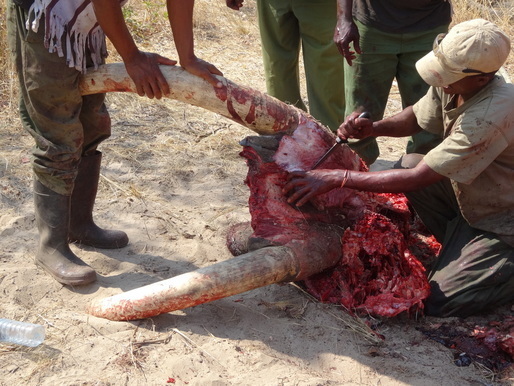 Poachers chop off the bone, meat and fat and keep only the tusks, or the ivory.